Is this one of those '45 no chromes, or has the chrome just worn off? I don't know very much (nada) about the post-22's. I can't find any trace of chrome anywhere on it. I wound up with a hoard (hundreds) of Canadian pennies and nickels (22-60ish, both) and am giving myself a crash course. No big key dates, less a 22 far rim, but still fun. 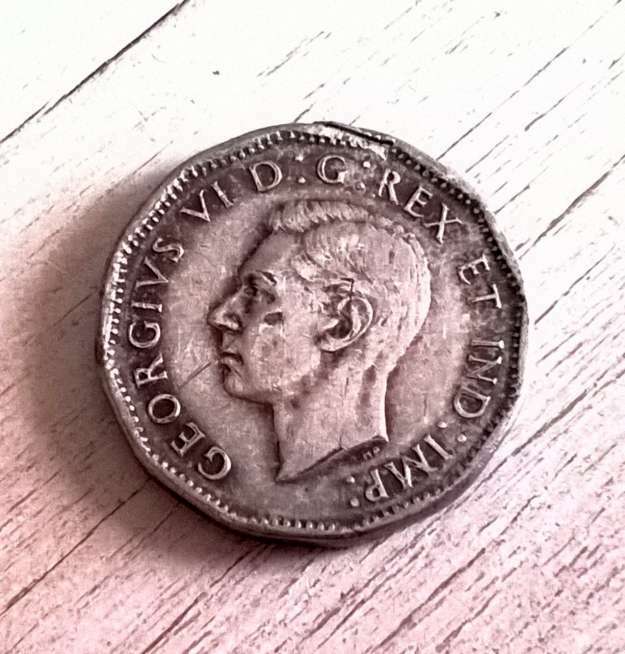 Just wondering about this one though if any war nickel pro's are out there. Is this one of those '45 no chromes, or has the chrome just worn off? That's a question for the ages. A better question to ask would be: why did these missing chromes not exist when I was young and when did they become accepted as a major variety? I have never seen a steelie in as bad shape as the one you're posting here Steve. Still, the plating seems to show in spots. In your opinion, do you think there is any chrome plating on it at all? To me it looks as though the chrome has been worn right through on the full downstroke of the last A in Canada. In the ancient past I probably plucked at least a roll or two of steel nickels from circulation and pretty well all were worn through the chrome on high spots or showing rust from under the chrome especially at the denticals. Not one of those I would consider to be missing chrome as I understand the term. To be clear; afaik I have never seen a missing chrome steel nickel from any year and therefore sceptical that they indeed exist. So there's the challenge. Can anyone convince me with a UNC or better example of one? To answer/respond to your first question: I have no clue? I'm new to post-22 nickels. Just wound up with a ton of them, and have enough to almost fill two or three books for my son with them. I've never seen one (until now), period. So, I look at it this way... it looks just like any US nickel/dime/quarter missing plating. Could be from years in a roll (which to address your pretty bad shape thoughts, maybe it stormed Juno Beach? ), someone may have dug it up. But to the other question, in hand, under the loop, no, I see no remaining trace of plating. Under high lighting and the 16x and 45x. Nothing that resembles plating. But to the other question, in hand, under the loop, no, I see no remaining trace of plating. Under high lighting and the 16x and 45x. Nothing that resembles plating. Then I suppose it's missing its chrome plating. I'm not going to deny that these are a legitimate variety quite yet, but what constitutes "missing chrome" vs the chrome stripped or worn from the steel is anyone's guess. Furthermore, shouldn't a BU example of one resemble polished steel? Next time I'm down at my LCS I'll try to remember to ask G if he has any missing chrome coins. I've been through all his 5c pieces and as far as I recall I didn't see one. I'm new to post-22 nickels. Just wound up with a ton of them, and have enough to almost fill two or three books for my son with them. I've never seen one (until now), period. Steve, unlike our current nickel-plated steel coinage covering the entire planchet, the ingots(?) used for '44, '45 and '51 thru '54s were plated then punched. If a steel nickel is "missing chrome" at the mint, then those would have to resemble and be the same colour as the outside of the rim. I assume missing chrome doesn't necessarily mean both sides, or does it? And if that's the case, by definition I can go even further and claim "missing chrome" status on a partially chromed coin as well, no? Steve, check this ebay item out. I'm not sure if this one is supposed to be missing the chrome entirely or just in some areas. To my eye the effigy looks chromed. This was an internal test to see if NGC would grade the piece missing the chrome layer. They did not. They also kept the original ICCS flip. Fully lustrous would warrant this coin grading MS64+ our in house grade is MS64 agreeing with ICCS. An excellent variety obviously missing the chrome layer. When you search ebay for "missing chrome" a lot of nickels come up that are just worn out junk or lustered in some areas and in others not, whereas some look like they may have only a light or weak chrome plating. Look at this and this-- to me they appear to be circulated bare steel. Wadaya think? That's very interesting. Extremely interesting, in fact. The effigy does look chromed to me too. 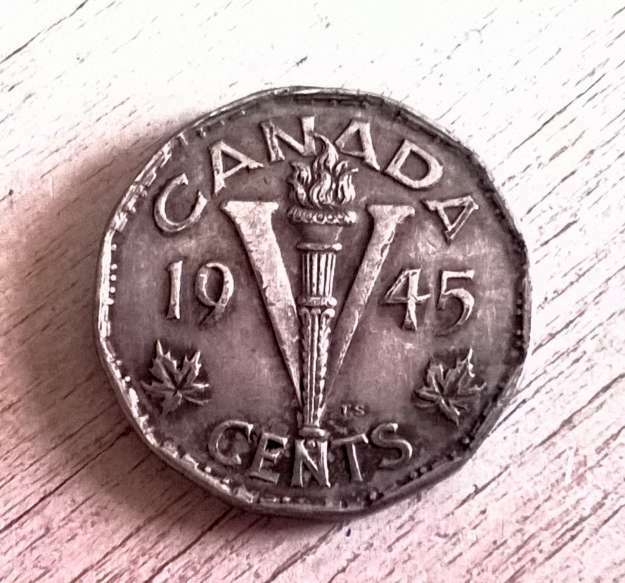 My seven year old son loves these Canadian nickels and pennies. I've gotten my hands on Zip Lock bags full of Canada smalls and post-22 nickels. Many 'varieties' are starting to raise questions in my mind. This one is certainly interesting. On a side note: did you hear that PGCS just certified (and ended the myth) about the 1974-D Lincoln aluminum experimental piece? Anyway, you've given me some food for though; and our 'chrome-less' '45 is now in my son's book.